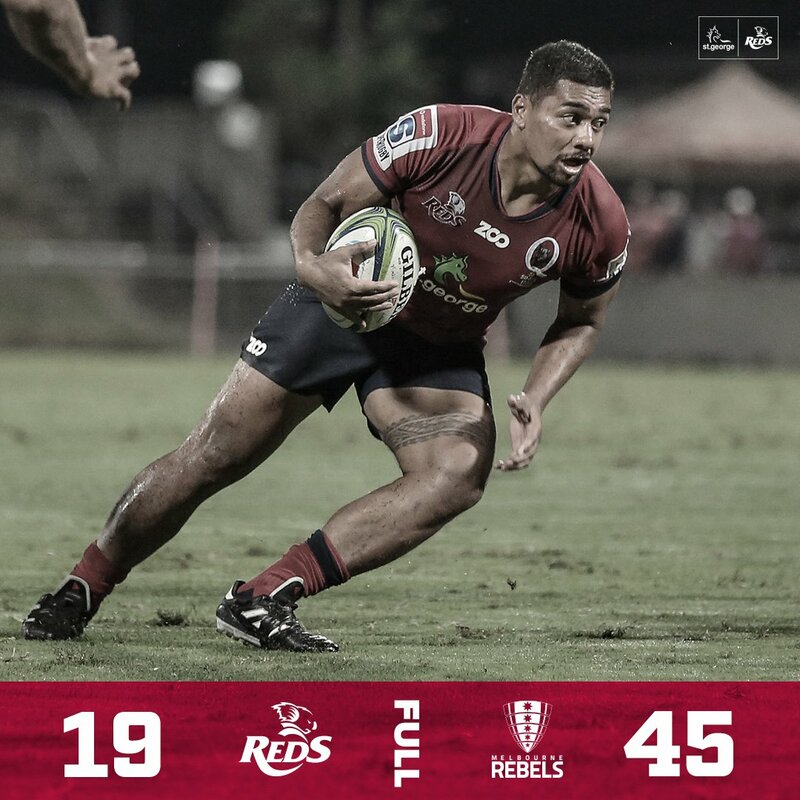 FULL-TIME: REBELS 45-19 REDS A comfortable ending to this game for the home side, as this game was won long ago. The Reds will take solace for the spirit they showed when down to 14, and temporarily 13, men in the first half. MISSED CONVERSION REDS Tuttle's attempt goes beyond the far post. A turnover on the left wing by the Reds allows Debreczeni to scoop up the ball and counter, but he grubbers into touch. He is furious with himself. MISSED CONVERSION REBELS Debreczeni hooks it this time. 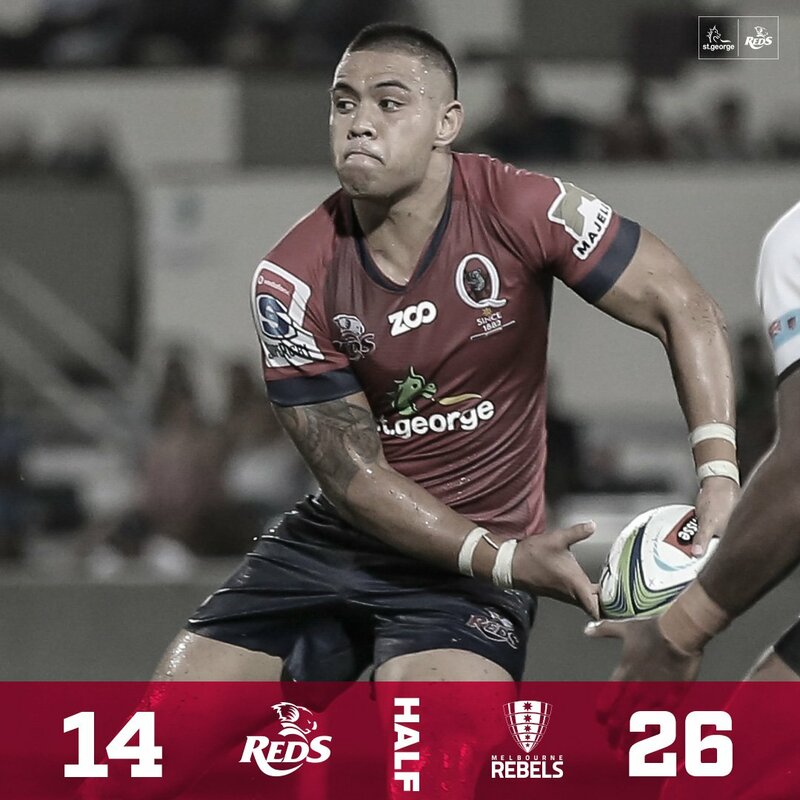 HALF-TIME: REBELS 26 - 14 REDS A crazy half to start the season ends. The Reds have paid the price for poor discipline and despite some great flashes in attack, you fear they might be too exhausted to put up a fight in this game having lost their captain so early. MISSED CONVERSION REBELS Debeczeni sees it go wide from the left touch. 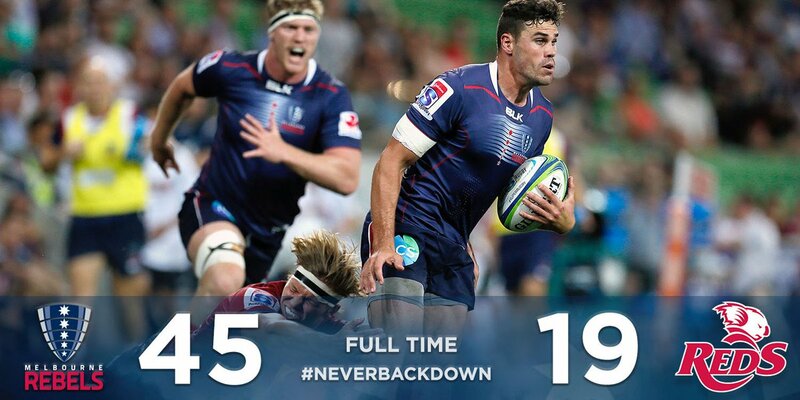 Genia drops the shoulder and throws the dummy to break from within his own half, before chipping over. Aidan Toua hacks it over the sideline. More pressure for the Reds to cope with, though they will be back to 14 shortly. YELLOW CARD REDS A dangerous tackle from Lukhan Tui, who dumped the ball-carrier on his head and took him over the horozontal, sees a sin binning. The Reds are down to 13! Samu Kerevi pumps the cross-field kick to the corner, with the advantage looming, but he just overcooks it. Chris Feauai-Sautia would have had a walk-in had it not been too strong. Eto Nabuli explodes away from his marker down the left wing, but is hauled down just before the line. The Reds look galvanised by the dismissal. MISSED PENALTY REBELS Reece Hodge has a go from the halfway line, but it is wayward. RED CARD Scott Higginbotham is given his marching orders for contact to the head after a TMO deliberation. Who saw that coming?! MISSED PENALTY REDS Jono Lance pushes it wide from distance. The Rebels are caught offside early, a penalty in midfield, about 45 metres out, for the Reds. Will Genia will debut for the Rebels against his former team, and he is joined by fellow Wallaby Dane Haylett-Petty. Adam Coleman debuts and captains his new team. Scott Higginbotham captains the Reds, while James Tuttle takes the jersey vacated by Genia. He partners Jono Lance. 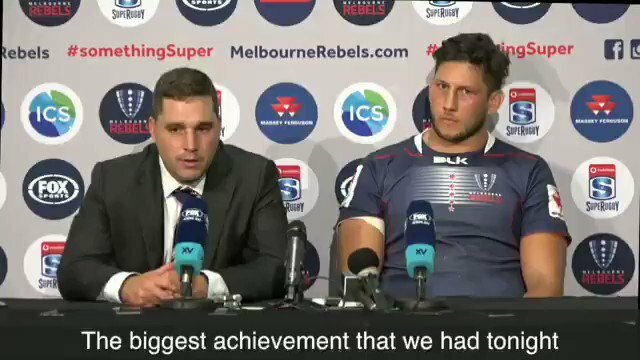 The Australia Conference season kicks off in Melbourne as the Rebels welcome the Reds. It's a fine late summer's evening. NEXT GAME | Head to Suncorp Stadium for our first home game of the 2018 Vodafone Super Rugby season. What impressed Coach Wessels most about the Reds game? 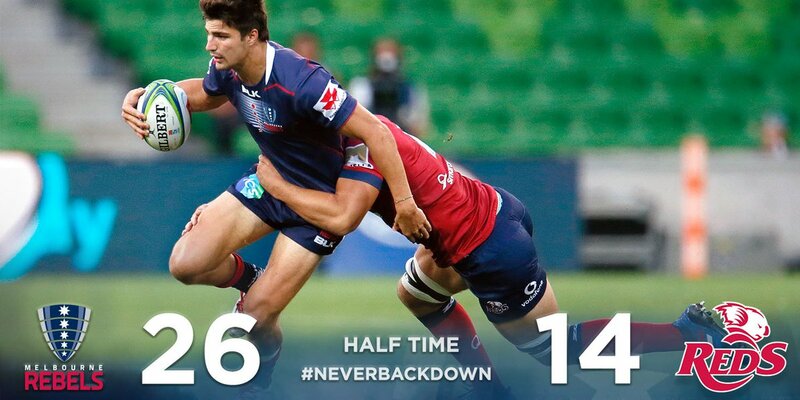 Second Half Kick-Off | Melbourne Rebels begin the second half kicking to the Reds.